Welcome! - Sebastien Varrette, PhD. 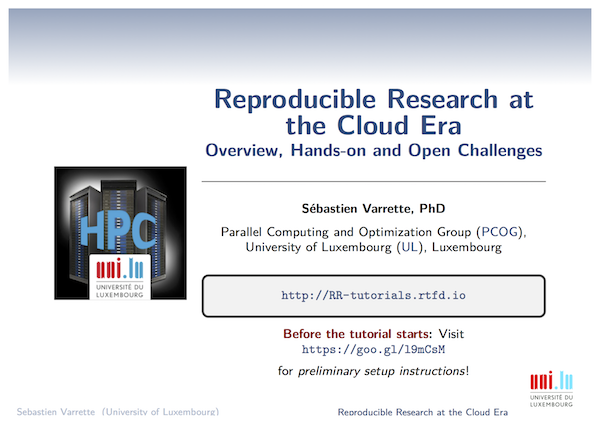 My name is Sebastien Varrette and I'm currently an experienced Research Scientist at the University of Luxembourg (UL). I'm also leading the management and development of the UL High Performance Computing (HPC) platform (i.e. the supercomputer of the UL), and the associated expert team of system administrators since I joined Prof. Pascal Bouvry in 2007. My main research interests lie in the domains of the security and performance of parallel and distributed computing platforms, such as HPC or Cloud Computing infrastructures. I also takes part for the management committee and represents Luxembourg within multiple EU projects, such as PRACE (acting Advisor) or ETP4HPC. More details are provided in my short biography. Below are a couple of recent events I wanted to highlight, among all my blog posts. New (french) books published in 2018! L'un dédié aux blockchains, et la 3ème édition de notre ouvrage consacré à la théorie des codes. We have finally deployed the iris cluster, part of the UL High Performance Computing (HPC) platform. Maître Gilbert Gruss, CN 9e Dan, est parti à l'âge de 73 ans dans la nuit du 1er au 2 octobre 2016. A large part of my time is dedicated to the management of the UL HPC Platform and of the associated expert team of system administrators. Get my tutorials and notes. You might also wish to take a look at the UL HPC tutorials developed in the context of the High Performance Computing School I organize twice a year. Get the slides I made covering a variety of topics. Get the Latest news and blog posts.